We've been working with such a great couple on their wedding invitations recently. The groom's family are involved in bee farming and as a nod to that art (and yes, we think it's an art! 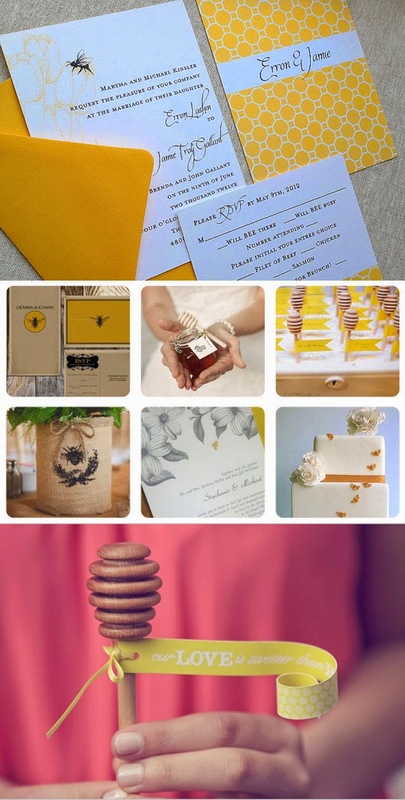 ), the couple wanted to bring an element of bees and honey into their wedding and of course, their stationery. We took to Pinterest to find some inspiration and to create a mood board. We love the butter yellows, craft browns, rough textures and golden oozing honey. Isn't it divine? Our couple has taken this bee theme and turned it up on it's head, lending it a much more elegant and sophisticated feel, with no yellow whatsoever. More on that to come soon though! 1. Look at using the honeycomb pattern in subtle areas - it looks great as a pattern behind menu's and any other printed goods you may have. 2. Honey favours are a really sweet way of bringing this theme into your reception - we love the idea of using a honey stirrer as a place seating card. Especially if there is a pot of honey waiting at your guests' seat! 3. Remember that a large part of this theme could be the butter yellow and brown craft colourway - incorporate these colours into your bridesmaids dresses and your flowers. 4. Bee icons are really on trend and are great motifs to include on printed items.